Our painters try to use environment-friendly paint or recycled paint when it’s possible. But it’s not always the case. For instance, Boomerang paint is considered environment-friendly because it has been recycled. This paint is actually a mixture of different latex paints that would have contributed to the air pollution in the United States otherwise, as they would have been used as a fuel in polluting factories. As for the Aura paint, I do not recommend it for ceilings because there exists many other options other with a matte finish a low VOC percentage. We can use Aura paint for walls. When painting a wall, we always look for the maximum lavability, especially in very passing areas and playrooms. Lesser gloss is better for obtaining a simple design and to diminish the appearance of imperfections. This is why we prefer a matte finish. 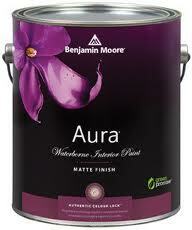 The only matte finish paint that has a great washability is the Aura paint, from Benjmin Moore. With a washability greater than the one of a typical velvet paint, Aura paint can be scrubbed (we can scrub it without taking out the colour) and is extra durable (won’t peel). Be aware that this paint is more expensive than the Boomerang. A good compromise would be using a non-expensive paint for bedrooms and for rooms other than playrooms. Bedrooms are used during the night, and the appearance of gloss won’t be seen in the dark. If your wall is covered with paneling, a good compromise will be possible because we generally use a pearl finish (or even a semi-gloss). We also generally use a pearl finish for wardrobes, mouldings, etc. This finish is very washable and you would save more money than by always using Aura paint. The paint we suggest using is VOC free, which means that it won’t pollute the environment and contribute to the smog (except for transport, of course). Of course, if your budget is unlimited, we could gladly use Aura paint everywhere. To learn more about washability, please see our article What is washable paint? For more information or to request a free estimate for your paint project, please contact us.